Good – Was magnificent in the Leeds European Cup semi final games of 1970 and a month later in the final in Milan against Feyenoord he saved Celtic from a severe defeat on that fateful night. Played 13 games against Rangers and was only on the losing side twice, a record he can be proud of. Probably had the most distinctive name of any Celtic ‘keeper. Bad – Took the flak for the 4-1 debacle against Partick Thistle in the 1971 League Cup final. On further inspection the McNeill-less defence was more culpable than their goalkeeper. Ugly – Lost two howlers in Switzerland against Basle in the European Cup quarter finals in March 1974. (One goal was scored by Ottmar Hitzfeld who managed Paul Lambert and Borussia Dortmund to Euro success in 1997). Evan never played for Celtic again after this match. Good – Had a magnificent game in Madrid against the animals of Atletico in the European Cup semi final of April 1974, when Celts almost pulled of the impossible of getting to the final against Bayern Munich in Belgrade. 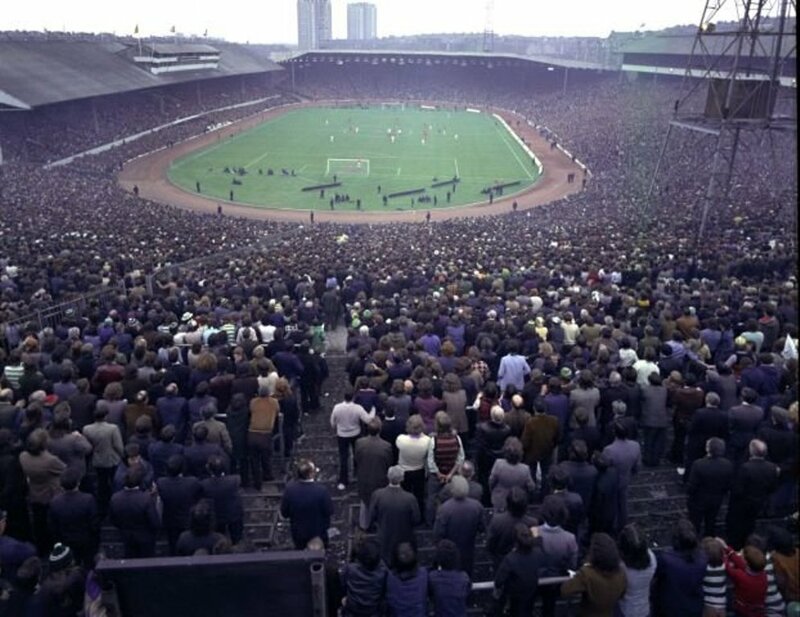 Spectacularly saved two penalties against Rangers at the Celtic end of Hampden (Aug 1974) when Celtic won the Drybrough Cup for the one and only time in a penalty shoot out. Bad – Lost a soft goal against Rangers (Sept 1974) when Ian McDougall’s shot crept in at his post thus causing a 2-1 defeat. Ugly – Scored a sensational own goal versus Airdrie at Broomfield in August 1974 when he literally threw the ball directly into his own net ! 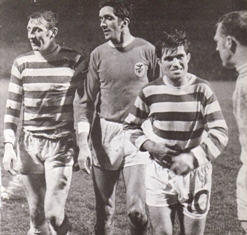 It is said even big Jock laughed at that one. 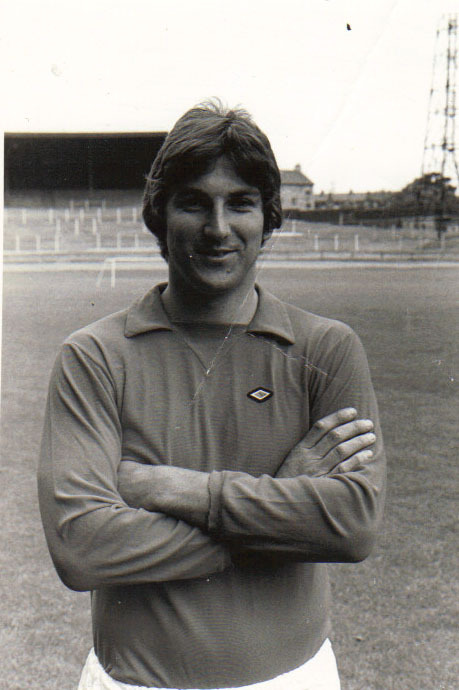 Good – Went six games without losing a goal in the Spring of 1973 and looked assured of a long future as a Celtic player and was Scotland’s first choice ‘keeper by the Autumn of 1973. We thought we had eventually found a replacement for Simpson at last. Bad – Lost a howler against Czechoslovakia to Nehoda at Hampden in 1973 on the night Scotland qualified for the 1974 World Cup finals in West Germany. Scotland won but Ally was never again picked for his country and his confidence suffered accordingly. Ugly – Given one last chance against Dundee United at Parkhead in January 1976 on a frost bound pitch and lost a bad goal to Henry Hall after only 30 seconds. Never played for Celtic again after that day. Always seemed to play in an unusual, horrible, red goalies jersey. Good – Saved a penalty against Boavista in Oporto in October 1975. Had several good games against Rangers, most noticeably in the 1980 Scottish Cup final where he excelled on the day. Memorable slide tackle against Eric Black at the corner flag versus Aberdeen in January 1986 much to the delight of the Parkhead crowd. Had a magnificent rapport with the Celtic fans. Bad – Had a shocker of a start to his Celtic career in the Spring of 1975, most noticeably when he allowed a 50 yard aimless free kick from Partick Thistle’s Danny Kellachan to float over him in March of that year. The fans could only stand dumbfounded wondering what we had let ourselves in for but the big man was to come good eventually. Ugly – Against Partizan Tirana in the European Cup in 1979, Alan Sneddon’s 30 yard back header looped over him in front of a stunned Celtic Park. Good – Was tremendous in the European away ties against Juventus (0-2 1981) and Ajax (2-1 1982). 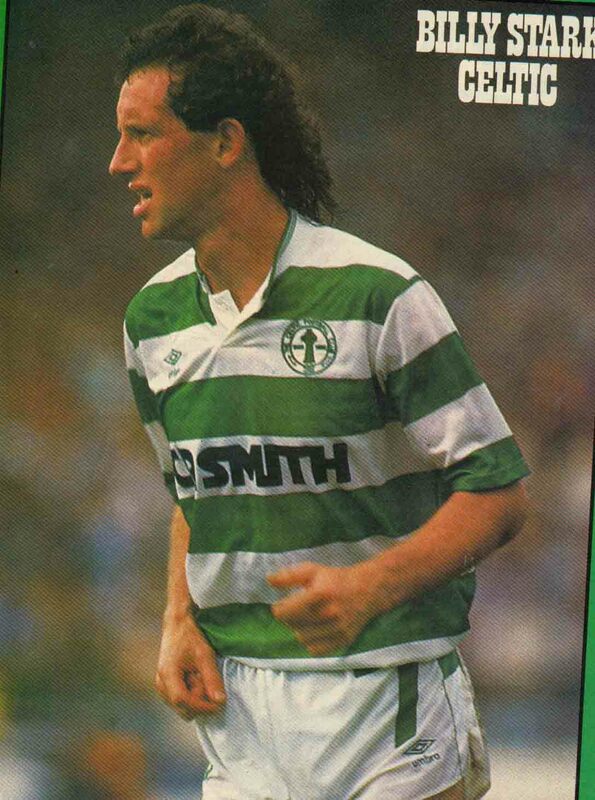 Played his part in the entertaining and successful Celtic side of the early 1980’s. Saved Celts from a heavy defeat at Ibrox in September 1990 with one save in particular from Peter Huistra which was simply magnificent. Earned himself a fine reputation at international level with many great displays for the Republic of Ireland. Bad – Seemed to keep all his blunders for Ibrox – too numerous to mention. Ugly – Lost a shocking goal against Rangers directly from a Mark Walters’ corner in January 1991. Good – Son of another Celtic goalie Gordon Marshall senior. Made several vital saves in the UEFA cup win against Cologne in September 1992 to help Celtic to a rare, memorable European win. Bad – Failed to hold a soft shot to allow McCoist to score a tap in against Rangers in the 1996 Scottish Cup semi final at Hampden. Ugly – THAT error against Raith Rovers which cost Celtic the 1994 Coca Cola cup final. He never really recovered from this and like many of his predecessors his performances suffered. Good – Kept Aberdeen at bay virtually single-handed in a crucial league at Pittodrie during the ‘10 in a row’ season in March 1998. 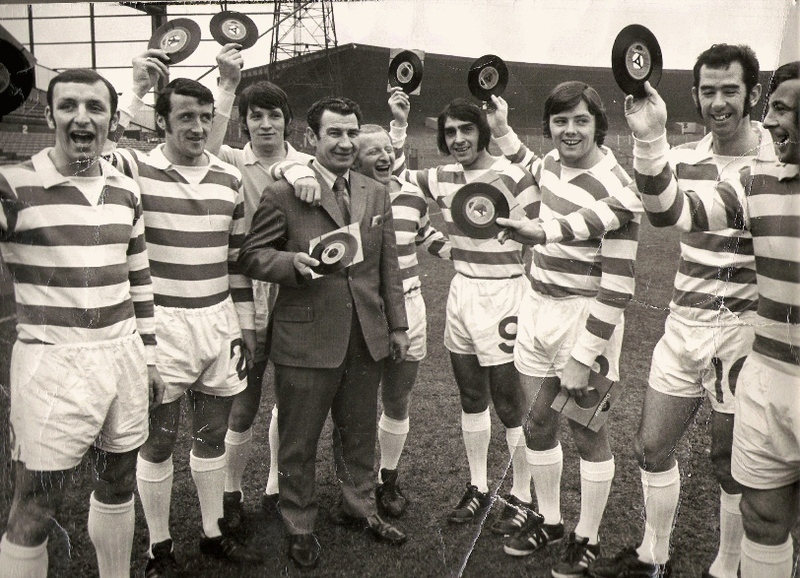 Played a major part in that title triumph during the course of that season with several great performances allowing us to say ‘cheerio’ to 10 in a row. Another who had a fine rapport with the fans and once asked the crowd for the loan of a hat on a sunny day at East End Park and was deluged with offers. Bad – Lost a terrible goal against FC Zurich in the 1998 UEFA cup when a long high cross on a windy night was misjudged and ended up behind him for a goal. Ugly – Was culpable against Inverness in January 2000 and inadvertently caused the dressing room bust up that followed and which cost John Barnes his job. Is said to have struck Mark Viduka in the dressing room which puts him right up in my estimation. Good – Had a great game against Valencia in the Mestalla in November 2001 and then saved two penalties in the shoot out in the return leg, sadly all to no avail. Bad – Should have done better in the Seville 2003 UEFA cup final when he should have saved 2 of the 3 goals he conceded and missed a chance to become a legend. Ugly – Lost a farcical goal to Mikel Arteta of Rangers in October 2002 when he let a 20 yard shot trundle under him. The game finished 3-3 and the other two goals he conceded were soft efforts also. Which brings us nicely to one Artur Boruc esquire. The holy goalie is already a thing of legend. The penalty save against Man Utd in the heat of the Champions League, the shoot out heroics against Spartak Moscow, the cool penalty he scored in another shoot out against Dundee United at Hampden, magnificent World Cup performances for Poland.…the list goes on. And yet something gnaws away at me saying that Artur’s best days are behind him and that blunders that were once rare lapses are becoming more common. Brian Clough used to leave the judgement of players to his right hand man, Peter Taylor. Taylor had a phrase – ‘he’s shot it’ – which referred to players that were on the slide. Clough couldn’t see it, the player himself certainly didn’t realise and the fans often could not comprehend it, but Taylor had that knack of knowing when to off load a player and cash in on him when his best days had gone. I now feel we are at that stage with Boruc and it would not surprise me to see him depart in the summer. Question is, after looking at the motley crew that preceded him between the Celtic posts, who will we attempt to replace Boruc with ?